A relaxation oscillator that generates a short-time-duration pulse by using a single transistor or electron tube and associated circuitry. Also known as squegger; squegging oscillator. 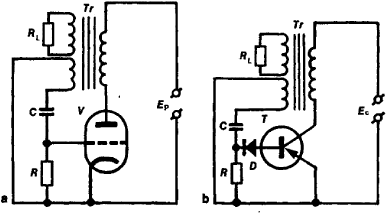 a single-tube or single-transistor oscillator with with strong transformer feedback that produces pulses of short duration which are repeated periodically after relatively long time intervals. The strong positive feedback in a blocking oscillator (see Figure 1) causes an avalanche-like growth and decay of current in the electron tube (transistor) during the formation of the leading and trailing edges of a pulse. The duration of a pulse (usually between 0.05 and 25 microseconds) is primarily a function of the charging time of capacitor C by the heavy current that flows in the circuit of the control grid (of a tube) or base (of a transistor) during the formation of the pulse peak and also of the transformer parameters, but the length of the interval between pulses (in the self-oscillating mode) is controlled by the discharge time of capacitor C through resistor R. The pulse duration can be adjusted within certain limits by varying the capacity of C. A blocking oscillator may be operated in the self-oscillatory (self-excitation of oscillations) mode and the driven (inhibited) mode—in which a pulse is generated each time by an external (triggering) pulse. Figure 1. Typical circuit of a blocking oscillator: (a) with an electron tube V; (b) with a transistor T. RL is the load resistance, Tr is the feedback transformer, D is a semiconductor diode that limits the current strength in the transistor’s base circuit, and Ep and Ec are the voltages of the plate and collector current supplies, respectively. The principal merits of a blocking oscillator are the simplicity of the arrangement, the ease of synchronization and stabilization of oscillations, and the possibility of obtaining a high-powered pulse having low average power. Blocking oscillators are used in pulse engineering to achieve powerful pulses of short duration, in television and radar scanning arrangements, in frequency dividers, and so on. Meerovich, L. A., and L. G. Zelichenko. Impul’snaia tekhnika. Moscow, 1953. Poluprovodnikovye triody v regenerativnykh skhemakh. Edited by V. V. Migulin. Moscow-Leningrad, 1959.